Maduro presented the initiative on Monday, during an event in Maracay, state of Aragua, to commemorate the civic-military rebellion on February 4, 1992, and called on the people to reject the aggression threats made by U.S. President Donald Trump. The U.S. president recently repeated that a military attack on Venezuela is an option, and admitted his refusal to a request to meet with his Venezuelan counterpart to discuss bilateral relations. Washington supported the self-proclamation as ‘interim president’ by the speaker of the National Assembly (Parliament) in contempt, Juan Guaido, an action that Venezuela denounced as an ongoing coup d’état, and stepped up the economic siege of the South American nation by imposing new sanctions on the oil industry. 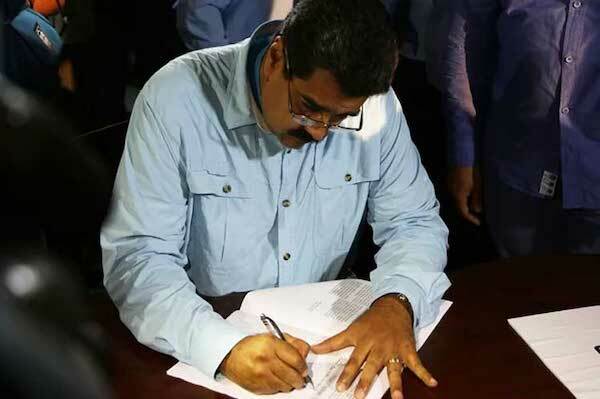 At a meeting with intellectuals at Casa Amarilla (Yellow House, the Foreign Ministry’s headquarters), Maduro urged Venezuelans to collect at least ten million signatures to send them to the White House ‘during a campaign of solidarity and aware raising’. The initiative is aimed at demanding respect for International Law, the end of intervention threats by the U.S. administration, respect for the constitutionality and legality of the Bolivarian government and the recognition of its sovereignty and independence. Maduro noted that the Venezuelan government is willing to talk with the opposition forces to achieve national reconciliation and understanding.